Cramster Balaclava Review | IAMABIKER - Everything Motorcycle! The Cramster Balaclava, also known as head mask is a head gear that covers the head and neck whole, exposing only a part of the face. Designed to be worn inside the crash helmets, the Balaclava is useful under all sorts of weather and riding conditions. 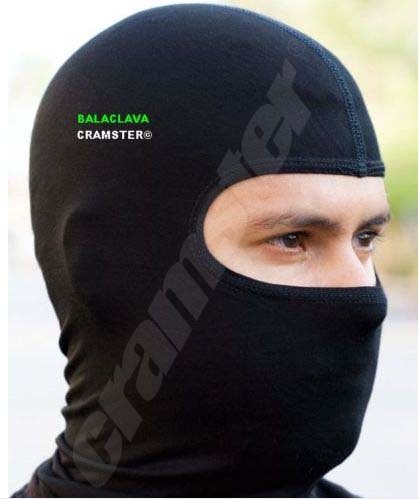 Among the cheapest branded balaclavas available on the market today, the Cramster Balaclava is made out of cotton and spandex/lycra fabric, which owing to its strechablity comes in one-size-fits-all design. The soft and lightweight material is a snug fit on the face and does not leave behind any creases after extended use. The long neck design lets the lower end effortlessly tuck into the riding jacket, thus protecting your neck from wind blasts on colder days. However, we would have loved an even longer design as the tip just about manages to stay tucked into the collar of the jacket. The fabric absorbs sweat and moisture easily, though if you’ve had your nose and mouth covered as well, it begins to feel a tab bit damp after a while. Some extra, breathable padding in the said region might help a long way in the comfort/feel of the balaclava. That said however, the fabric does not hinder the air flow and at no point does it let you feel choked. The balaclava is more on the thinner side than thick, which makes it even easier to be worn on warm days as well. As pointed out earlier, the sweat absorbed goes a long way in keeping you cool on such days. On the other hand, in cooler temperatures, the fabric does manage to keep you sufficiently warm, if not as warm as wollen ones. Unless you’re using them in extremely cold conditions, the Cramster Balaclavas does just fine. In all, a quality and versatile product that goes a long way in keeping the dirt, insects and cold out while encasing you in a soft hold. Oh and don’t worry, you can style your hair in easily too. Its easily streched for that one curl you want right inside the helmet.